For the first time at Naviance Summer Institute, we are offering a full track of focus group discussions to allow attendees to provide input on Naviance features and solutions. Do not miss your chance to spend invaluable time with Hobsons product managers during the NSI Product Innovation Forums. The Product Innovation forums are intended for all stakeholders to provide input on the future of Naviance, and will help drive strategy and functionality for the future of Naviance. To add your voice to these conversations you must sign up in advance. Space is limited. Discuss the increasing importance surrounding outcomes of your students to your school, district, and state in terms of college placement, retention, majors, and career placement. Discuss how you are getting information about alumni, analyzing outcomes, and incorporating it into programs. Discuss how you are helping students demonstrate career readiness and what the future of Career Technical Education may look like. Discuss how you are connecting and communicating with college admissions offices. Share what information and support you need from colleges to help your students be more successful. Discuss all of the student attributes that are important to share with a college during the admissions process, including non-traditional activities and information. Share possible solutions for helping colleges see a full picture of each student. 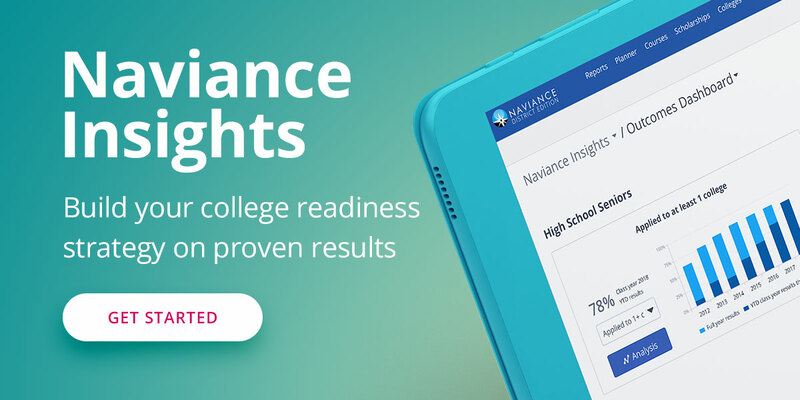 Discuss the features of Naviance with which you find the most value. Share how you fund Naviance and what major needs you have that would bring more value to your institution. Discuss course planning needs and how to assist students in developing course plans that prepare them for postsecondary success. View all of the sessions being offered at Naviance Summer Institute 2016 here. Register for NSI here, and sign up for the Product Forums for your chance to have your voice heard.